Mom For A Deal: Daily Deals for Moms, Babies & Kids - up to 90% off! Daily Deals for Moms, Babies & Kids - up to 90% off! Zulily is fabulous! It’s an online store offering daily sales events on top-quality apparel, gear and other goodies for moms, babies and kids. They carry the best brands at the lowest prices. Members enjoy savings of up to 90% off retail prices. Zulily loves to find deals on favorite styles, and they love introducing our members to exciting new brands, too. 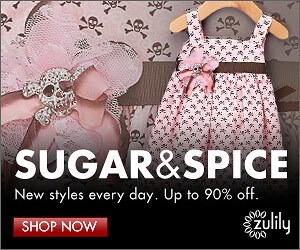 Zulily is not a traditional online store. Instead, they feature new items every day. They find great buys from lots of brands and work with them to ship you the goods. Zulily events last 72 hours . . . then they’re gone! New brands move in and get their three days on the site. Each weekday, they offer at least five limited-time shopping events. Membership is free, sign up today! Also, for every new friend you invite to zulily, you'll receive a $15 credit to use on the site after your friend's first purchase has shipped. There is no limit to how many friends you would like to invite or how many credits you can earn!